1:59:00. What a rush! Everything clicked. Seven months later I ran the Penn Relay Marathon in Philadelphia with a goal of 3:30 and finished in 4:24, making all the rookie mistakes. How did you train differently in your younger years? Now? When I got serious about running, I joined the Rock Creek Running Club (RC2) and later the GNATS (National Capital Track Club). The training and camaraderie paid off, and I ran my second marathon and first MCM in 3:39. At my peak I was running 100 miles a week. 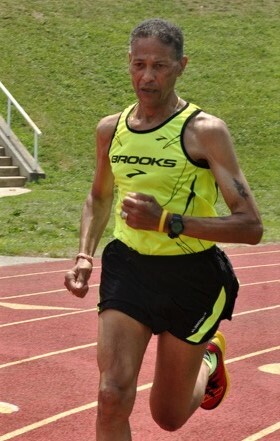 Now, my training includes a walk/run regimen, gradually cutting the walking and increasing the runs and the pace. I get up at 4:30 a.m. and am at the gym by 5. What were some of your better / memorable races? 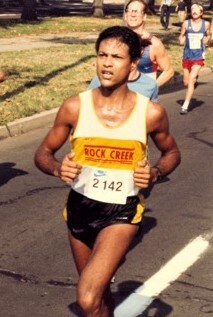 1984: Ran my half-marathon PR of 1:22:40 set at the Philadelphia Distance Run. 1987: Ran my 400-meter PR of 1:05 set at The Mid-Atlantic Corporate Relays. 1987: Ran my 1600-meter PR of 5:18.0 set at the Mid-Atlantic Corporate Relays. 1988: Ran my marathon PR of 3:04 set at the Houston-Tenneco Marathon. 2014: Ran my 100th marathon at the MCM. It was a momentous occasion for me. My wife and kids were at the finish wearing Tee shirts that read, “Team George.” They presented me with a Tee shirt of my own which read, “I did it!” I still get chills thinking about that day. Has your diet changed through the years? I eliminated alcohol about 30 years ago and recently gave up coffee. I stopped eating meat 10 years ago and don’t miss it. I'm not very strict foodwise. I love my chocolate. 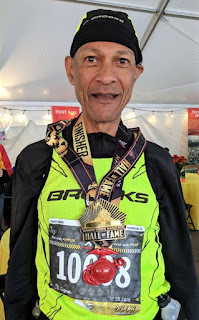 Obstacles along the way: In September of 2015, after experiencing slower times and shortening of breath, I saw a doctor (first time in 26 years) at Walter Reed Hospital and was diagnosed with atrial fibrillation. I ran three more marathons after being diagnosed. In October 2016, more tests revealed mitral valve prolapse. 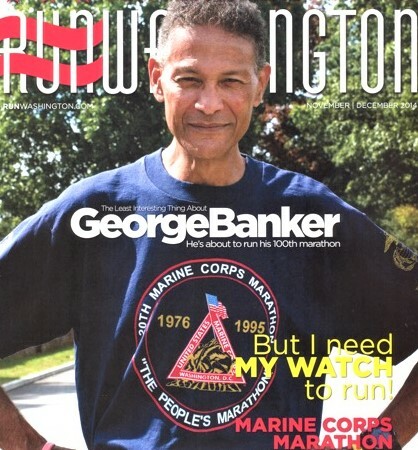 Despite the news, a few weeks later I participated in my 32nd Marine Corps Marathon, not willing to stop the streak. Eventually, like a house of cards, my running came crashing down. In May 2017 I ran my 111th marathon. Two months later, I had heart surgery to correct the mitral valve prolapse and irregular heartbeat. Does it bother you to get slower? I don’t waste time thinking about past performances. The beauty is that I know what I used to do, but I still don’t know what I can do and that’s the new thrill. I have no desire to set a PR at any distance and then be in rehab for weeks. I’m not training for the Olympics so whatever I run is good in my book. Running-training philosophy: Running gives me a sense of well being. It has too many positive effects not to like it. Yes, there is a lot of hard work and dedicated time, but it is for the greater good. It forces you to get in tune with your body and mind. You learn to manage your time better. And let’s not forget the wonderful people you meet in the sport. You have little control over family and work, but with running you have more control. You can run fast or slow, hard effort or easy. The control brings a peace of mind. You can feel safe with your own thoughts. How has running helped you with the aging process? Running is my reason to keep going. It’s about doing what makes your heart happy. Running helps me to stay focused and set goals and to go after them. And it keeps me social. You don’t need anyone to run with, but it sure makes it easier and the time goes by quickly. And every five years we get to be young again…new age group! As far as aging is concerned, I feel you get out of it what you put into it. Our body is like a car, let it sit and the engine rust. Or you can put some pressure on the pedal and keep the pipes clean. What are the biggest lessons (life lessons and running lessons) you learned from running? Aging is a good thing. It gives us the experience we need to move forward in a positive direction. I know what it takes to run a 3:30 marathon, but I can also run a six hour marathon and say, "Oh, baby, I did it." I can’t stop the aging process, nor do I want to. I will continue to run for as long as I can, and my body will let me know when it’s had enough. My new motivator is not a PR but my health and heart. What advice would you give a younger runner who wants to be a lifelong runner? Be careful what you ask for. If the motivation is for health, fitness, discipline, and well being, then you are at the right place. Find a balance between the mental and physical side of the sport. Be prepared to give up something to get something along the way. Stay flexible, and adjust your goals. Remember to run how you want and not how others want you to. What are you most proud of? My biggest achievement, besides marrying the perfect woman (Bernadette, 47 years and counting), is capturing 30 years of history with the MCM in a book I wrote in 2008, The Marine Corps Marathon: A Running Tradition. At 69, I’ve had many thrilling life experiences. God gave me the talent to be a journalist, and a photographer and also the ability to run. I’ve been a race director, and a trainer. It is through running that I have lived an enriched life.